We’ll Help Get Your Garage Organized! Is your garage so full there’s no room for the family car? Are you unable to locate essential tools or holiday decorations? Is your lawn mower hard to reach when you need it? Many homeowners use their garage to store everything that won’t fit in their house. Over time, a garage can become filled to capacity. That wonderful area where you once worked on your favorite projects is now an eyesore! That space where you used to store your car is now jam-packed with cartons! 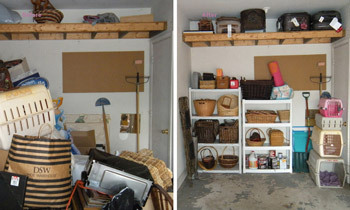 If you could use assistance getting your garage organized, Cheryl’s Organizing Concepts can help. Our professional organizers have helped homeowners just like you throughout the Washington-Baltimore Metro Areas since 2002. We’ll work side-by-side with you to sort through all those long-ago stashed items and decide what to keep, what to give away and what to discard. Once everything is sorted, we’ll do storage organizing and systematically arrange and mark the containers, so you’ll always know where to locate what you have. Our goal is that once we leave, you’ll have a system in place that keeps your garage organized for good! If you need help getting your garage in shape and want to learn more about how garage organizing works, please contact Cheryl’s Organizing Concepts.